The circadian clock is an endogenous mechanism that coordinates biological processes with daily changes in the environment. In plants, circadian rhythms contribute to both agricultural productivity and evolutionary fitness. In barley, the photoperiod response regulator and flowering-time gene Ppd-H1 is orthologous to the Arabidopsis core-clock gene PRR7. However, relatively little is known about the role of Ppd-H1 and other components of the circadian clock in temperate crop species. In this study, we identified barley clock orthologs and tested the effects of natural genetic variation at Ppd-H1 on diurnal and circadian expression of clock and output genes from the photoperiod-response pathway. Barley clock orthologs HvCCA1, HvGI, HvPRR1, HvPRR37 (Ppd-H1), HvPRR73, HvPRR59 and HvPRR95 showed a high level of sequence similarity and conservation of diurnal and circadian expression patterns, when compared to Arabidopsis. The natural mutation at Ppd-H1 did not affect diurnal or circadian cycling of barley clock genes. However, the Ppd-H1 mutant was found to be arrhythmic under free-running conditions for the photoperiod-response genes HvCO1, HvCO2, and the MADS-box transcription factor and vernalization responsive gene Vrn-H1. We suggest that the described eudicot clock is largely conserved in the monocot barley. However, genetic differentiation within gene families and differences in the function of Ppd-H1 suggest evolutionary modification in the angiosperm clock. Our data indicates that natural variation at Ppd-H1 does not affect the expression level of clock genes, but controls photoperiodic output genes. Circadian control of Vrn-H1 in barley suggests that this vernalization responsive gene is also controlled by the photoperiod-response pathway. Structural and functional characterization of the barley circadian clock will set the basis for future studies of the adaptive significance of the circadian clock in Triticeae species. The circadian clock is an autonomous oscillator that produces endogenous biological rhythms with a period of about 24 hours. This clock allows organisms to anticipate predicted daily changes in the environment and to coordinate developmental and metabolic processes with environmental cues, such as light and temperature, that cycle with the rotation of the earth [1–5]. Conceptually, a circadian system comprises three basic components: input pathways that sense light and temperature, a core oscillator that defines the rhythm, and output pathways that control various developmental and metabolic processes, resulting in the optimal adaptation to daily changing environments. The core oscillator that generates circadian rhythms is comprised of autoregulatory interlocking positive/negative feedback loops. In the eudicot Arabidopsis, the central loop called the “core oscillator” is composed of two partially redundant Myb-like transcription factors, CIRCADIAN CLOCK ASSOCIATED 1 (CCA1)  and LATE ELONGATED HYPOCOTYL (LHY) , and the pseudo response regulator (PRR) TIMING OF CAB EXPRESSION 1 (TOC1). The morning expressed CCA1 and LHY repress TOC1 by directly binding to its promoter, which results in the evening accumulation of TOC1 that in turn represses CCA1 and LHY expression . These three genes are critical to sustain rhythms as the cca1 lhy toc1 triple mutant was found to be arrhythmic . The core oscillator is further fine-tuned by a morning-phased loop and an evening-phased loop. The morning loop includes members of the pseudo response regulated gene family, PRR3, PRR5, PRR7 and PRR9 which contain a pseudo receiver domain at the N terminus and a CCT (CONSTANS, CONSTANS-LIKE, and TOC1) motif at the C terminus [10, 11]. PRR transcripts start accumulating after dawn sequentially in the order of PRR9, PRR7, PRR5, PRR3, and PRR1/TOC1, and it has been shown that PRR7 and PRR9 repress CCA1 and LHY during the day . The evening-phased loop is proposed to include GIGANTEA (GI), ZEITLUPE (ZTL), TOC1, and an unknown factor Y. GI decreases TOC1 protein level through stabilization of the ZTL protein [13, 14]. The decreased TOC1 protein tends to relieve repression of Y, increased Y expression in turn activates TOC1 expression, so that Y directly and GI indirectly activate TOC1 expression . Output pathways from the oscillator convey circadian rhythms to the various physiological and molecular processes, which include many with agronomic importance, such as photosynthesis, growth, phytohormone signaling, and photoperiodic flowering [16, 17]. The circadian clock may thus be a key for improving agronomic performance and stress adaptation of crops. Indeed, diurnal expression analysis of field grown maize showed that ~22% of all genes in leaf tissue exhibit diurnal expression patterns . In addition, a null allele of the rice GI ortholog affected diurnal expression of 75% of all tested genes and conferred reduced seasonal adaptability in field grown rice . 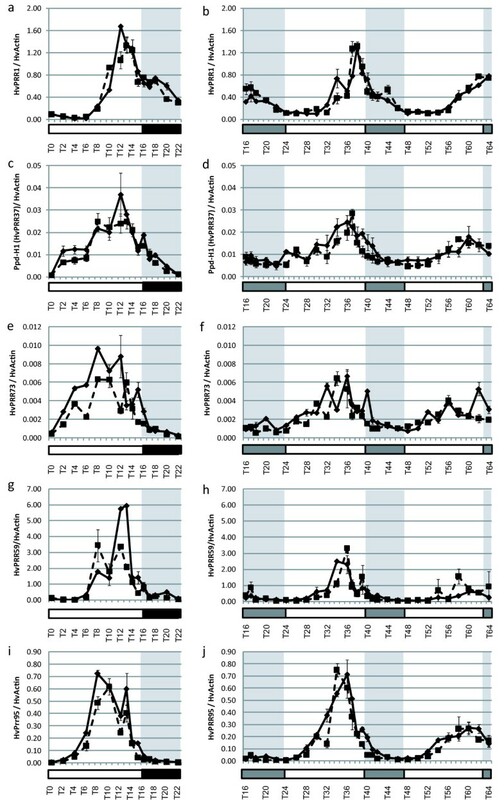 These studies highlight the critical role of the clock in cereals. Some orthologs of Arabidopsis core-clock genes have been identified in the monocot plants rice  and Lemna[21, 22]. The rice genome was reported to encode a single ortholog for LHY and CCA1 and five PRR orthologs designated as OsPRR1 orthologous to TOC1, OsPRR73/OsPRR37 corresponding to AtPRR7 or AtPRR3, and OsPRR59/OsPRR95 corresponding to AtPRR5 or AtPRR9. Over-expression of OsCCA1 or OsPRR1 in Arabidopsis modified circadian rhythms . Rice orthologs of TOC1 and PRR7 partially complemented the corresponding Arabidopsis toc1 and PRR7 mutants, which is consistent with the function of these proteins being conserved between monocots and Arabidopsis [20, 24]. A full compendium analysis of the monocot clock awaits to be performed. The temperate crop barley, which includes the domesticated form Hordeum vulgare spp. vulgare and the wild subspecies Hordeum vulgare spp. spontaneum, is characterized by high genetic diversity and good adaptation to stress prone marginal environments [25, 26]. Interestingly, adaptation in barley is influenced by the photoperiod response gene Ppd-H1, also known as HvPRR37, which is orthologous to the rice gene OsPRR37 and the Arabidopsis clock gene PRR7. A natural, recessive mutation in the CCT domain of Ppd-H1 causes photoperiod insensitivity and late flowering in cultivated spring barley. In contrast, wild and cultivated winter barley genotypes harbor the photoperiod responsive Ppd-H1 allele, which induces early flowering under long photoperiods. Barley genotypes with a photoperiod responsive Ppd-H1 allele are characterized by elevated expression of Vrn-H3 (HvFT1) homologous to the Arabidopsis gene FLOWERING LOCUS T (FT). In Arabidopsis, FT is the mobile florigen hormone that moves as a protein from the leaves through the phloem to the shoot apical meristem where it induces the switch from vegetative to reproductive growth [28, 29]. FT expression is triggered by the photoperiod response gene CONSTANS (CO). CO protein is degraded in darkness and expression of the protein during the day is crucial for induction of the floral activator FT and flowering . It was suggested that the mutation in Ppd-H1 of spring barley delayed flowering time by shifting the diurnal expression peaks of the barley CO orthologs HvCO1 and HvCO2 into the dark phase, so that the proteins are not synthesized and Vrn-H3 (HvFT1) not expressed . Winter barley is vernalization sensitive, exposure to prolonged periods of cold during winter are translated into an increased competence to flower in spring. Vernalization response is controlled by variation at the vernalization genes Vrn-H1 and Vrn-H2 and by the MADS-box transcription factors HvVrt2, HvBM1, and HvBM10, which are cereal orthologs of SHORT VEGETATIVE PHASE (SVP) in Arabidopsis [31, 32]. In winter barley, Vrn-H1, with similarity to the Arabidopsis meristem identity genes APETALA1, CAULIFLOWER, and FRUITFUL, is only expressed after exposure to cold . Insertions or deletions in the first intron of Vrn-H1 in spring barley cause up-regulation of the gene independently of vernalization . Spring barley is also characterized by a deletion of the entire Vrn-H2 locus, which includes one truncated and two full sequence ZCCT (Zinc finger and CCT domain) genes with no clear orthologs in Arabidopsis . In photoperiod-sensitive winter barley, Vrn-H2 represses Vrn-H3 (HvFT1) to counteract the Ppd-H1 dependent long day induction of Vrn-H3 prior to winter. Up-regulation of Vrn-H1 during vernalization and consequent down-regulation of Vrn-H2 transcript levels in the leaf facilitate the up-regulation of Vrn-H3 during long days mediated by Ppd-H1. HvVrt2, HvBM1, and HvBM10 are floral repressors, which may act downstream of Vrn-H1 and HvFT1 in barley, and thus, integrate light and temperature dependent regulation of flowering [31, 37]. However, the effects of variation at Ppd-H1 on circadian expression of photoperiod and vernalization response genes have not yet been analyzed. The natural mutation in the Ppd-H1 gene may affect the photoperiod and vernalization pathways either by changing circadian timing of clock genes or by direct control of flowering time genes independently from its clock function. In this study, we analyzed whether orthologs of Arabidopsis clock genes are structurally and functionally conserved in the temperate crop and long-day plant barley. For this we 1) identified barley clock orthologs from available genomic databases and 2) analyzed their diurnal and circadian expression patterns in two barley genotypes differing at the photoperiod response gene and clock ortholog Ppd-H1. We showed that barley clock orthologs exhibit a high level of sequence similarity and conservation of expression profiles as compared to Arabidopsis and rice clock genes. The natural mutation at Ppd-H1 did not affect expression of clock genes, but caused arrhythmicity of clock output genes HvCO1, HvCO2, and Vrn-H1 under constant conditions. Our study provides a characterization of the compendium of barley clock genes under circadian conditions, and sets the basis to explore the effects of the circadian clock on performance in temperate crop species. The spring barley cultivar Scarlett and an introgression line S42IL-107 derived by crossing Scarlett with the wild barley accession ISR42-8 were used in this study [38, 39]. Scarlett has a mutation in the CCT domain of Ppd-H1 and is late flowering under LD . The introgression line S42IL-107 harbors the photoperiod responsive Ppd-H1 allele introgressed from wild barley and is early flowering under LD. Replicate plants of both genotypes were grown in soil in a controlled environment growth chamber (Conviron) at 20°C/18°C day/night with a photoperiod of 16-h light and 8-h darkness (LD treatment). After two weeks of LD treatment, replicate plants per genotype were harvested for a total of 24-h, starting at the transition to lights on in the morning (T0). Night samples were collected in the dark. After LD sampling, plants were released into continuous light at constant 20°C (LL treatment). Collection of leaf material was started at T16 and sampling was carried out for a total of 48-h. Under LD and LL, leaf material was sampled every 2-h, while at the end of the day and beginning of the night (or subjective nights) sampling was performed every hour. Each sample contains the second youngest leaves of three pooled plants. Samples were immediately frozen in liquid nitrogen and stored at −80°C until required. Sequences of HvGI, Ppd-H1 (PRR37), and PRR73 were retrieved from the literature [27, 40, 41]. To identify orthologs of CCA1/LHY, PRR1, PRR5, and PRR9 we used the barley database of DFCI Barley Gene Index Project (TIGR gene index project at http://compbio.dfci.harvard.edu/tgi/definitions.html). Expressed sequence tag (EST) sequences (and Tentative consensus (TC) sequences,) that had high sequence similarity with OsCCA1 (Os08g0157600), OsPRR1 (Os02g40510) and TaPRR1 (AK333193), OsPRR59 (Os11g05930) and OsPRR95 (Os09g36220) were recovered. Primers were designed on the basis of the homologous EST sequences and used to amplify from a cDNA pool of Golden Promise a full-length cDNA for HvCCA1 and a partial gene for HvPRR1 (Additional file 1: Table S1). RNA extraction and cDNA synthesis were performed as described in the next paragraph. Amplifications of 2 μL f cDNA were conducted in a 20 μL PCR reaction volume containing 0.4 μM of each primer, 1 U of TAQ polymerase (GO Taq, Promega), 0.08 mM dNTP, 1.5 mM MgCl2. Amplification conditions were as follows: 98°C for 5 min, 35 cycles of 98°C (1 min), 56°C (30 sec) and 72°C (3 min), followed by an extension step at 72°C (7 min). Amplified fragments were cloned using the TOPO TA cloning kit (Invitrogen) following manufacturer instructions. For each gene, two independent clones were identified and sequenced. Sequence analysis, alignments, and in silico translations, were performed using programs within the Lasergene® 8 suite (Dnastar, Madison WI). Orthologous protein sequences for clock genes in Arabidopsis and monocots were retrieved from TAIR (http://www.arabidopsis.org/), NCBI (http://www.ncbi.nlm.nih.gov/) and Phytozome (http://www.phytozome.net/) databases. If no protein sequences were found, they were generated by virtually translating the mRNA sequences from the NCBI database (Lasergene® 8 suite, Dnastar, Madison WI). Accession numbers are listed in Table 1. For each gene family, sequences were aligned by the CLUSTALW method using the MEGA5 program . The evolutionary distances were computed using the Poisson correction method . All positions containing gaps and missing data were excluded. The phylogenetic analysis was performed using the neighbor-joining method within the MEGA5 package . We used 10,000 trials to obtain bootstrap values. The alignments used for the phylogenetic analysis are available as Additional file 2: Figure S1, Additional file 3: Figure S2, Additional file 4: Figure S3. Total RNA was extracted from 100 mg of tissue using TRIZOL® reagent (Invitrogen) following manufacturer’s instructions, except for the addition of RNaseH, followed by a DNase treatment (final volume 100 μL). First strand cDNA synthesis was performed on 4 μL of total RNA using 100 U of SuperScriptTM II RT (Invitrogen) and 500 ng of poly-T primer and following manufacturer’s recommendations (final volume 40 μL). The resulting cDNA was diluted 1:4 in nuclease-free water and stored in aliquots at −20°C. Real-Time-quantitative PCRs (qRT-PCR) were performed on cDNA samples using gene-specific primers (Additional file 1: Table S1). Amplifications were performed using 4 μL of cDNA, 0.5 U of GoTaq DNA polymerase (Promega), 0.2 mM dNTP, 2.5 mM MgCl2, 0.2 μM each primer, and 0.5 μL of EvaGreen (Biotium) in a final volume of 10 μL. Reactions were performed in a LightCycler480 (Roche) with the following amplification conditions: 95°C for 5 min, 45 cycles of 95°C (10 s), 60°C (10 s) and 72°C (10 s). Appropriate non-template controls were included in each 384-well PCR. Dissociation analysis was performed at the end of each run and the melting curves for each primer pair showed a single peak confirming the specificity of the reaction. The standard curves were prepared from a dilution series of plasmids containing the target fragments and subjected to qRT-PCR analysis with the respective cDNA samples. Starting amounts for each data point were calculated based on the titration curve for each target gene and the reference (HvActin) gene using the LightCycler 480 Software (Roche; version 1.5). Expression values shown in the figures represent the average ± standard deviation of 2 technical replicates of the ratio between the target and reference gene values. Barley sequences with high similarity to OsCCA1, OsPRR1, OsPRR59, and OsPRR95, orthologous to CCA1/LHY, PRR1, PRR5 and PRR9 in Arabidopsis were recovered from the barley EST databases. Based on the tentative consensus sequences (TCs), we obtained a full-length clone for HvCCA1 (accession number JN603242) and a partial sequence for HvPRR1 (accession number JN603243) from Golden Promise cDNA. Barley gene sequences of HvGI, HvPRR37 (Ppd-H1) , HvPRR73  were retrieved from the gene banks. In order to examine the structural conservation of these potential circadian clock genes in barley, candidate clock sequences from barley were compared in multiple protein alignments to orthologous sequences from Arabidopsis and monocot species, including rice, Brachypodium, maize, sorghum, and wheat (Additional file 5: Table S2). In barley, five distinctive PRR sequences could be identified. These fell into three major clades, the PRR1/TOC1 clade, the PRR3/7 clade, and the PRR5/9 clade (Figure 1a). Orthologs of OsPRR1 clustered with PRR1/TOC1 from Arabidopsis and the PRR1-like genes could clearly be recognized as an outgroup of the PRR gene family. Each of the two remaining PRR clades showed two subgroups for monocot orthologs OsPRR37, OsPRR73 and OsPRR59, OsPRR95, respectively. AtPRR3 and AtPRR7 were outgroups to the two monocot gene clusters PRR37 and PRR73. AtPRR5 and AtPRR9, however, grouped with the monocot PRR95 genes, while the monocot PRR59 sequences formed a separate cluster. Genetic distances were calculated from protein sequences for entire orthologous gene sequences or for domains within the monocot species and across the monocot species and Arabidopsis (Table 2). Variation in genetic distances between domains, genes and group of genes may indicate differences in evolutionary history and in the conservation of gene functions. Within the PRR genes, average genetic distances across Arabidopsis and monocots were lowest for the PRR1 gene group with a genetic distance of 0.39, followed by PRR3/7 with 0.51 and PRR5/9 with 0.86 (Table 2). The derived PRR amino-acid sequences were found to be most similar within their pseudo-receiver domain (mean genetic distance 0.32), and at the C-terminal end (mean genetic distance 0.22), which contains a CCT motif that is commonly also found in the CONSTANS (CO) family of flowering regulators  (Table 2, Additional file 4: Figure S3). Phylogenetic relationships of circadian clock related proteins. Neighbor-joining phylogenetic trees were built from the protein alignments of the indicated sequences. a) PRR gene family, b) CCA1/LHY gene family, c) GI genes. Accession numbers are given in Table 1. Bootstrap values were calculated from 10,000 permutations. The identified HvCCA1 protein sequence showed a high similarity to OsCCA1 and the redundant pair CCA1/LHY in Arabidopsis, as evidenced by the phylogenetic tree (Figure 1b). Sequence distances between HvCCA1 and OsCCA1 were 0.26, while the overall mean distance across CCA1 and LHY in Arabidopsis and the monocot species was 0.55 (Table 2, Additional file 5: Table S2). The CCA1 protein sequences exhibited the highest sequence identity of 0.95 at the single MYB DNA-binding domain at its N-terminal end (Table 2, Additional file 3: Figure S2) [6, 7]. Multiple sequence alignments using the GI proteins from the six monocot plants and Arabidopsis showed that the GI protein was characterized by the lowest overall mean sequence distance (0.18, Table 2, Figure 1c). HvGI was most similar to TaGI and BdGI with sequence distances of 0.03 and 0.07, respectively (Additional file 1c). HvGI was most similar to TaGI and BdGI with sequence distances of 0.03 and 0.07, respectively (Additional file 2: Figure S1, Additional file 5: Table S2). GI thus appears to be evolving slowly. From our alignments we concluded that the barley sequences HvCCA1 and HvPRR1, and the identified clones AK376549 (HvPRR73), AK361360 (HvPRR59) and AK252005 (HvPRR95) were the likely orthologs of CCA1/LHY, TOC1/PRR1, PRR3/7 and PRR5/9 from Arabidopsis. In addition, mean distances calculated for protein sequences of the different clock genes across six different monocot species revealed that GI showed the highest conservation with a mean distance of 0.10, followed by PRR1 (0.22), and CCA1 (0.27). The two clades of PRR37/73 and PRR59/95, which have evolved after the split of the eudicot and monocot lineages, showed the highest mean distances with 0.46 and 0.90, respectively. In order to study the functional conservation of transcript accumulation rhythms in the circadian clock of barley, clock orthologs were analyzed for diurnal and circadian expression patterns from young leaf tissue. In addition, we tested the effects of the natural mutation in the CCT domain of Ppd-H1 (PRR37) in the spring barley Scarlett on diurnal and circadian expression of clock and clock output genes. Plants of both genotypes were entrained under long day photoperiods (16-h light/8-h dark) for 2 weeks. Subsequently, leaf samples were harvested every two hours under light/dark (LD) for 24 hours and under continuous light (LL) for 48 hours. Additional sampling (every hour) was performed at the end of the day and beginning of the night (or subjective nights). This provided both a diurnal and free-running sampling series. The expression of circadian-clock orthologs in barley seedlings oscillated under LD, and the rhythm was sustained under LL conditions. The PRR orthologs were expressed in a sequential manner in the order of HvPRR73/HvPRR37, HvPRR95/HvPRR59 and HvPRR1. Expression of HvPRR37 (Ppd-H1) and HvPRR73 started rising at T2, HvPRR95 at T4, HvPRR59 at T6, and HvPRR1 at T8. Expression peaks of HvPRR37 (Ppd-H1) and HvPRR73 were broader than those of the other HvPRR genes, so that expression peaks of HvPRR37 (Ppd-H1) and HvPRR73 coincided with that of HvPRR59 and HvPRR95 at T8, whhile HvPRR1 peaked at T12 (Figure 2). HvCCA1 expression started rising before subjective dawn and showed rhythmic peaks 4 hours after light on under LD and 4 hours after subjective dawn under LL (Figures 3a, b). HvGI exhibited an expression peak between T10-T14 under LD conditions and T12-T14 under LL conditions (Figures 3c, d). We did not observe significant differences in the expression patterns, period or amplitude of barley circadian-clock genes between the two genotypes differing at the natural mutation in Ppd-H1. The sustained oscillations of barley clock genes under free-running conditions showed that these are under circadian control (Figure 2, Figure 3). The natural mutation in the CCT domain of Ppd-H1 in barley did not affect diurnal or circadian expression of barley clock gene orthologs. Diurnal and circadian expression of PRR genes in the spring cultivar Scarlett ( ppd-H1 ) and the introgression line S42 IL-107 ( Ppd-H1 ) under long day and free running conditions. Scarlett (solid line) and S42-IL107 (dashed line) were grown under long day conditions (16 hours light - left panel) for two weeks and then released in continuous light (right panel). Transcript accumulation was measured at two-hour intervals (one-hour interval at the end of the day and beginning of the night/subjective nights) by qRT-PCR analysis of specific genes and normalized to HvActin. Values represent the average of two technical replicates ± standard error. Black and grey bars indicate objective and subjective nights. Diurnal and circadian expression of HvCCA1 and HVGI in the spring cultivar Scarlett (ppd-H1 ) and the introgression line S42-IL107 (Ppd-H1) under long day and constant light. Scarlett (solid line) and S42-IL107 (dashed line) were grown under long day conditions (16 hours light - left panel) for two weeks and then released in continuous light (right panel). Transcript accumulation was measured at two hour intervals (one-hour interval at the end of the day and beginning of the night/subjective nights) by qRT-PCR analysis of specific genes and normalized to HvActin. Values represent the average of two technical replicates ± standard error. Black and grey bars indicate objective and subjective nights. In Arabidopsis, important circadian-controlled processes include the photoperiod-dependent control of flowering time [46, 47]. In order to further characterize the barley circadian clock and test for effects of the natural mutation at Ppd-H1 on clock output pathways, we analyzed diurnal and circadian expression of candidate genes from the photoperiod pathway. We selected HvCO1 and HvCO2, the barley orthologs of the circadian controlled photoperiod response gene CONSTANS[41, 48] and HvFT1, the barley ortholog of the Arabidopsis FT. In addition, three MADS box transcription factors involved in flowering time control in barley were selected. These include Vrn-H1, a flowering activator putatively downstream of HvFT1, and two repressors of flowering, HvVRT2 and HvBM1 orthologous to SVP (Short Vegetative Phase) in Arabidopsis . 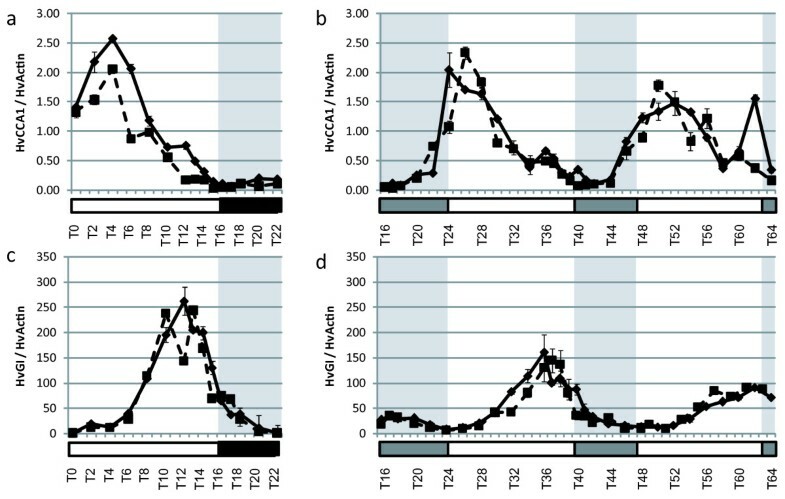 Expression profiles under LD and LL conditions showed that all six genes cycled under diurnal and circadian conditions in at least one genotype (Figure 4). Differences in expression between the two genotypes differing at Ppd-H1 were observed for HvCO1, HvCO2, HvFT1, Vrn-H1, HvVRT2, and HvBM1. Under LD conditions, HvCO1 and HvCO2 expression cycled in both genotypes, but HvCO2 expression was lower in Scarlett (Ppd-H1) than S42-IL107 (Ppd-H1) between T16 and T18 (Figures 4a, c). Under LL, HvCO1 and HvCO2 continued to cycle approximately once every 24-h in S42-IL107, while expression peaks of both genes were two- to threefold lower in Scarlett as compared to S42-IL107 (Figures 4b, d). In addition, in Scarlett, HvCO1 expression peaked at T18 and T46 and showed a strong delay in oscillation peaks under LL. HvCO2 only displayed a circadian rhythm in S42-IL107 (Ppd-H1) and showed an arrhythmic and low expression under LL in Scarlett, which harbors the mutated Ppd-H1 allele. HvFT1 expression was below detection in Scarlett, but in S42-IL107, it oscillated with a peak in the afternoon (T13), both under LD and LL (Figures 4e, f). Vrn-H1 showed a significantly lower expression in Scarlett than in S42-IL107 under LD (Figure 4g). 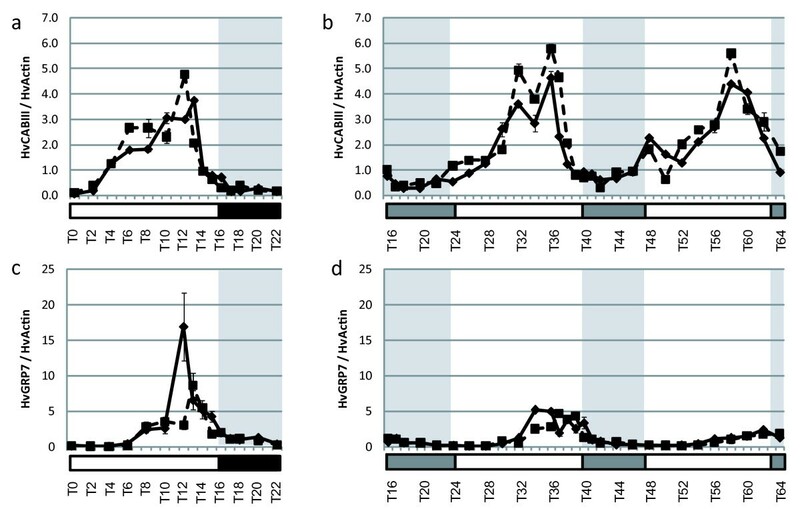 Under LL, Vrn-H1 expression only cycled in S42-IL107, but not in Scarlett (Figure 4h). HvVRT2 and HvBM1 cycled under LD and LL conditions in both genotypes (Figures 4i-l). S42-IL107 (Ppd-H1) exhibited a lower expression of HvVRT2 than Scarlett (Ppd-H1) under LD and LL. All analyzed flowering-time genes were thus characterized by rhythmic expression that persisted under LL conditions. However, the natural mutation in Ppd-H1 strongly delayed and dampened circadian rhythms of HvCO1, HvCO2 and Vrn-H1 under LL. Furthermore, HvFT1 expression could not be detected in Scarlett with the mutated Ppd-H1 allele. Diurnal and circadian expression of flowering genes in the spring cultivar Scarlett ( ppd-H1 ) and the introgression line S42 IL-107 ( Ppd-H1 ) under long day and free running conditions. Scarlett (solid line) and S42-IL107 (dashed line) were grown under long day conditions (16 hours light - left panel) for two weeks and then released in continuous light (right panel). Transcript accumulation was measured at two hour intervals (one-hour interval at the end of the day and beginning of the night/subjective nights) by qRT-PCR analysis of specific genes and normalized to HvActin. Values represent the average of two technical replicates ± standard error. Black and grey bars indicate objective and subjective nights. In addition, we analyzed diurnal and circadian expression of the chlorophyll a/b-binding protein HvCABIII and HvGRP7, the barley ortholog of the Glycine Rich RNA-binding protein GRP7, also termed cold-circadian rhythms-RNA binding (CCR2) . These two genes are known clock output genes from the photosynthetic pathway  and slave (non-self-sustaining) oscillator , respectively. We found that both genes showed rhythmic expression under LD and LL and no significant differences were observed between genotypes (Figures 5a–d). These two genes were thus under circadian control in barley and were not affected by variation at Ppd-H1. Diurnal and circadian expression of clock output genes HvCABII and HvGRP7 in the spring cultivar Scarlett (ppd-H1) and the introgression line S42 IL-107 ( Ppd-H1 ) under long day and free running conditions. Scarlett (solid line) and S42-IL107 (dashed line) were grown under long day conditions (16 hours light - left panel) for two weeks and then released in continuous light (right panel). Transcript accumulation was measured at two hour intervals (one-hour interval at the end of the day and beginning of the night/subjective nights) by qRT-PCR analysis of specific genes and normalized to HvActin. Values represent the average of two technical replicates ± standard error. Black and grey bars indicate objective and subjective nights. Early work in wheat has already demonstrated that monocots possess an endogenous circadian clock, Cab-1 gene expression continued to cycle in wheat plants that had been transferred to continuous light or darkness . The recent availability of monocot plant-genome sequences allows determination of the extent to which the genetic clock model developed from Arabidopsis is conserved and can thus explain endogenous cycling of gene expression in monocot crops. In this work, we demonstrated structural similarities between the potential barley clock orthologs and rice and Arabidopsis clock genes (Figure 1, Additional file 2: Figure S1, Additional file 3: Figure S2, Additional file 4: Figure S3, Additional file 5: Table S2). PRR genes from six different monocot species and Arabidopsis as an eudicot species clearly separated into three clades (PRR1/TOC1 clade, PRR3/7 clade, and PRR5/9 clade) (Figure 1). Each clade contained genes from both eudicots and monocots, confirming that ancient PRR gene(s) diverged into three clades before the speciation of monocots and eudicots . Within the PRR3/7 and PRR5/9 clade the relationships between the Arabidopsis genes and monocot orthologs could not be resolved confirming that since the divergence of monocot and eudicots these clades have expanded independently in both lineages as a result of genome duplication . Additionally, the high average distance of PRR37/73 and PRR59/95 orthologs, as compared to the other clock genes, suggests functional divergence and specialization that occurred in the monocot lineage. In contrast, CCA1 sequences showed a high similarity within the monocots (0.27), as compared to the two paralogous genes, CCA1 and LHY in Arabidopsis (0.75). This suggested conservation of CCA1 gene function in monocots as compared to stronger diversification between the paralogous genes in Arabidopsis (Figure 1b, Table 2, Additional file 5: Table S2). Two CCA1 paralogs were found in the monocotyledonous plant Lemna, suggesting that duplications/deletions of clock genes occurred throughout the evolution of eudicots and monocots . 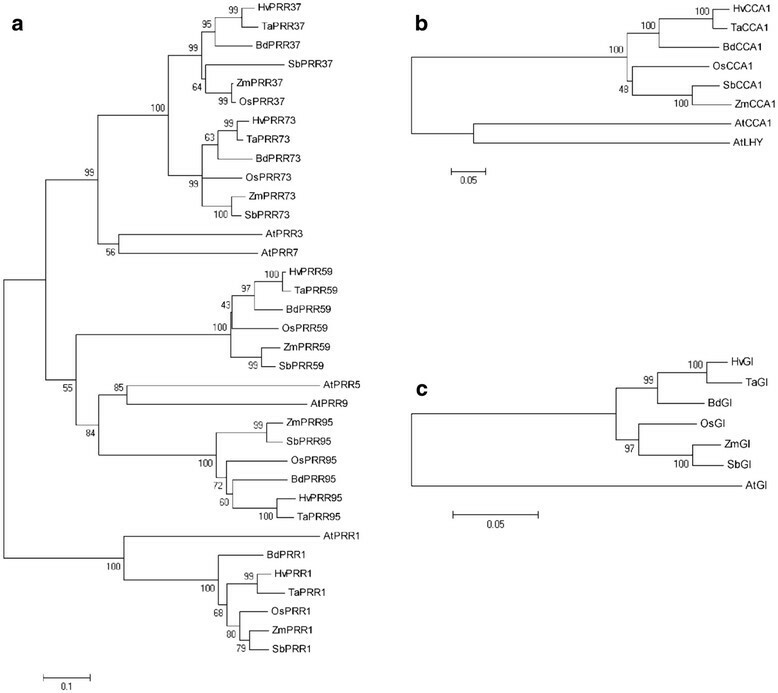 Phylogenetic analysis of GI sequences confirmed high amino-acid sequence identities within the monocots and between monocots and Arabidopsis. High levels of conservation of GI have already been demonstrated for seed plants, including monocotyledonous plants, such as rice (Oryza sativa) , Brachypodium , wheat , barley , and the eudicotyledons, such as pea . Our data suggest that Arabidopsis clock genes are conserved in barley and other monocot species. However, differences in gene number (CCA1/LHY) and genetic differentiation within gene families (PRR gene family) suggest evolutionary modification of clock related components between barley and Arabidopsis. The similarities between the clock amino-acid sequences of H. vulgare and Arabidopsis suggest similar molecular functions of these proteins. Barley clock genes cycled under free-running conditions and their temporal expression profiles were similar to those in Arabidopsis. This indicated that transcriptional regulatory mechanisms are likely conserved between these species. Functional conservation of some clock orthologs has been demonstrated for the monocotyledonous plants rice  and Lemna. Conservation of expression patterns of barley clock orthologs under LD and LL support the suggestion that clock orthologs function in the circadian clock in barley. Despite structural and functional conservation, divergence between Arabidopsis and monocot clock genes is suggested by evolving functions in the PRR7 lineage in monocots. In the monocots, barley and wheat, PRR37 (Ppd-H1 and Ppd-A1-D1, respectively) is one of the major determinants of photoperiod sensitivity and flowering time [27, 61]. In Arabidopsis, PRR7 contributes to the determination of flowering time, although the effects are not large and PRR7 may not be major determinant of flowering time among natural populations . In Arabidopsis expression of the PRR1/TOC1 family members is under the control of a coordinate circadian rhythm at the level of transcription such that the PRRs mRNAs start accumulating sequentially after dawn with 2 to 3 hours intervals in the order of PRR9, PRR7, PRR5, PRR3, and PRR1/TOC1. It was demonstrated that light stimuli and possibly phytochromes are crucial to induce the early transcription of PRR9, and this event appears to link the intrinsic oscillation of the AtPRR1/TOC1 circadian waves to the entrained external photoperiod . Like in Arabidopsis, PRR orthologs in barley were also expressed in a sequential manner at approximately 2 hours intervals from each other (Figure 2). However, in contrast to Arabidopsis Ppd-H1 (HvPRR37) and HvPRR73, and not the barley orthologs of PRR9, showed the earliest increase in expression after dawn and were followed by expression of HvPRR95/HvPRR59 and HvPRR1. This expression pattern was similar to the sequential expression of PRRs in rice with OsPRR73 (OsPRR37) induced first after dawn, followed by OsPRR95 (OsPRR59) and OsPRR1. In rice, the circadian-shape of OsPRR73 was markedly affected by the photoperiodic conditions, whereas OsPRR1 was not affected by changes in photoperiod. Such photoperiodicity-dependent changes in the circadian-profiles have been reported for certain circadian controlled Arabidopsis genes, which include the CO gene that encodes a crucial regulator of flowering time. These findings suggest differences in the control of PRRs between Arabidopsis and the monocots rice and barley. Differential regulation of PRRs in Arabidopsis and monocots may be the key to understand why natural mutations in Ppd-H1 (HvPRR37) and (Hd2) OsPRR73 cause variation in flowering time in barley and rice [27, 65], while mutations of PRR7 do not have strong effects on development in Arabidopsis. The PRR7 orthologs in barley and wheat may affect flowering through changing circadian parameters or through a clock independent function of the gene. In order to pursue this question, we tested the effects of a natural mutation at Ppd-H1 on diurnal and circadian expression profiles of core clock and output genes. Expression of barley clock genes and the clock output genes HvCABIII and HvGRP7 did not differ between the two genotypes harboring a different Ppd-H1 allele under LD or LL (Figures 2, 3, 5). These results suggest that the mutation in the CCT domain of Ppd-H1 does not affect diurnal and circadian cycling of clock genes in barley. In contrast, expression profiles of barley flowering-time genes showed significant differences between both genotypes. The Ppd-H1 mutant was found to be arrhythmic under free-running conditions for the photoperiod-response genes HvCO1, HvCO2, and the MADS-box transcription factor and vernalization responsive gene Vrn-H1 (Figure 4). A wild-type Ppd-H1 allele was thus necessary to maintain circadian oscillations of these genes under constant light. Cycling of HvCO1, HvCO2, and Vrn-H1 was observed in Scarlett (Ppd-H1) under LD as compared to LL. This suggested that light/dark cues were necessary for diurnal oscillations in the presence of a mutated Ppd-H1 allele. Separate effects of the mutation in Ppd-H1 on circadian expression of flowering time genes and clock orthologs indicate independent functions of this gene in the clock and photoperiod pathways. PRR9, PRR7, and PRR5 positively regulate flowering time in Arabidopsis through the activation of CO expression during daytime . Our results show that under LL, variation at Ppd-H1 also controlled HvCO-like gene expression in barley. However, under LD, variation at Ppd-H1 did not show clear effects on diurnal expression profiles of HvCO1 and HvCO2; while the mutation in Ppd-H1 had a significant effect on HvFT1 expression levels also under LD. Ppd-H1 may thus also affect HvFT1 expression independently of HvCO-like gene transcript accumulation under LD. These results are supported by a recent analysis of a spring barley Bowman and a derived introgression line carrying a mutation in HvElf3, the barley ortholog of Elf3 in Arabidopsis. 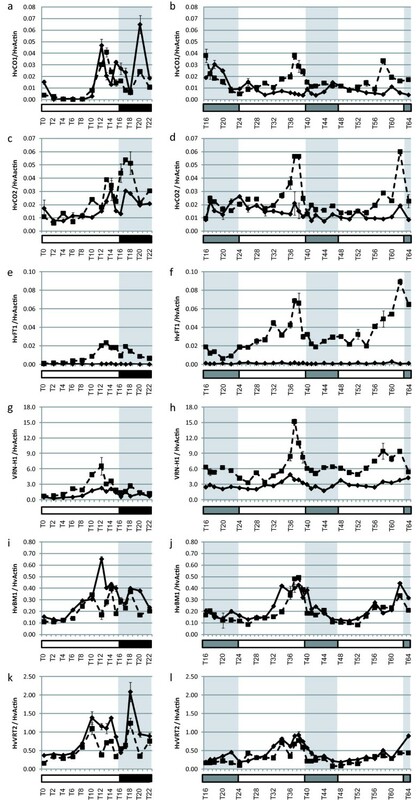 Elevated levels of HvFT1 expression and early flowering in the introgression line as compared to the recurrent parent Bowman did not correlate with higher expression of HvCO1. It has already been shown that functional variation at Ppd-H1 and Ppd-A1-D1 has a major effect on expression of HvFT1 and TaFT in barley and wheat, respectively [27, 61]. Structural conservation of PPD1 in wheat and barley (Figure 1) may thus reflect also functional conservation. However, in contrast to barley, functional variation at Ppd-D1a in wheat is associated with a deletion in the promoter and mis-expression of the gene, in contrast to Ppd-H1 in barley that harbors a change in the protein coding sequence [27, 61]. The PRR37 ortholog of the short day plant Sorghum was recently identified as a repressor of flowering under long day conditions . The repressive function of SbPRR37 was due to a bimodal expression with peaks in the morning and evening which were controlled by light and the circadian clock. Loss-of-function mutations in SbPRR37 and short day abolished the evening phase expression of SbPRR37 and caused significant effects on flowering time and expression of SbCO and SbFT, the Sorghum orthologs of CO and FT. Variation at both genes, Ppd-H1 and SbPRR37 showed significant effects on expression of the FT orthologs and flowering in the respective inductive day-length. In contrast to the study on Sorghum, we show that the floral inducer Ppd-H1 in the long-day-grass barley does not exhibit the light dependent second expression peak in the evening under LD. In addition, the hypomorphic mutation in Ppd-H1 caused a reduced and arrhythmic expression of HvCO1/HvCO2 only under LL, while the loss-of-function allele of SbPRR37 abolished the second evening peak of SbCO under LD and LL, as compared to a bimodal expression of SbCO in the Sorghum wild type. Taken together, our results suggest that PRR37 is regulated differently in long and short day grasses and mutations in the gene have differential effects on downstream genes, photoperiod sensitivity and flowering. Interestingly, we identified strong correlations in the expression patterns of HvCO1/HvCO2 and Vrn-H1 under LD and LL. Correlation of expression patterns may indicate that Vrn-H1 expression is affected by Ppd-H1 through HvCO1/HvCO2. Expression of Vrn-H1 in Scarlett was reduced, but cycled in LD, and was dampened with a trend towards arrhythmicity in LL (Figures 4g, h). It has been reported that Vrn-H1 is primarily controlled by vernalization, while photoperiod affects Vrn-H1 expression only indirectly through controlling Vrn-H2 expression . Our results indicate that Vrn-H1 expression is circadian controlled and directly or indirectly affected by the mutation in Ppd-H1. In Arabidopsis, the Vrn-H1 orthologs AP1 and FUL have not been reported to cycle under constant conditions . In barley, HvVRT2 and HvBM1, which act as repressors of flowering in barley , were also under circadian control. Both genes showed higher expression levels in the late flowering genotype Scarlett, but diurnal and circadian cycling did not differ significantly between the two genotypes. Lower expression of HvVRT2 and HvBM1 in the early flowering S42-IL107 (Ppd-H1) than in the late flowering line Scarlett (Ppd-H1) may thus reflect differences in development rather than direct effects of the mutation in Ppd-H1. It was first shown in wheat that transcript accumulation of the Cab-1 gene, encoding the light-harvesting chlorophyll a/b binding protein, was under circadian control . However, the more tractable model plant Arabidopsis served then to advance the mechanistic understanding of how the circadian clock keeps time in plants. Recent technical advances enable us now to return to the crops and to study inter- and intraspecific modulation of circadian time-keeping and its effects on adaptation and fitness in crops. The present study has demonstrated a high degree of conservation of the circadian clock genes in barley as compared to Arabidopsis and rice. However, differences in gene numbers, diversity, and in the function of Ppd-H1 suggest evolutionary modification of clock related components. Our results indicate that Ppd-H1 in barley has evolved novel functions in the control of flowering time, which are independent of its function in the circadian clock. Direct or indirect regulation of Vrn-H1 by the circadian clock and Ppd-H1 suggest modification of the photoperiod response pathway in barley as compared to Arabidopsis where the orthologs AP1 and FUL are not known to be under circadian control. In addition, our results suggested differences in the regulation of PRR37 (Ppd-H1) in the long-day grass barley as compared to the short-day grass Sorghum. Structural and functional characterization of the barley circadian clock will set the basis for future studies of the adaptive significance of the clock in Triticeae species. We thank Dr. K. Pillen, University of Halle-Wittenberg for the genetic material of Scarlett and the introgression line S42IL-107. We are grateful for the excellent technical assistance by K. Luxa and E. Luley. This work was supported by the Max Planck Society, a fellowship of the Deutscher Akademischer Austausch Dienst (DAAD) to MS, and grants from the Deutsche Forschungsgemeinschaft (DFG) to SJD and MvK. CC carried out the sequencing, phylogenetic analyses, expression profiling and drafted the manuscript. MS contributed to the expression profiling. SJD conceived the study and drafted the manuscript. MK conceived the study, participated in its design and coordination, and drafted the manuscript. All authors read and approved the final manuscript.